The Head of the Charles Regatta is considered by many to be the biggest crew competition in the United States. The two-day rowing event features some of the best high school and club teams throughout the United States, creating very fierce competition. After a successful national championship last spring and a fantastic start to its season, the Chaminade crew team was more than prepared to compete in the premier rowing event of the fall season. On Sunday, October 22, the final day of the event, the Flyers were ready to race. While the conditions were cold and windy on the Charles River, the team did not let the conditions stand in its way of succeeding. Feeling confident and very excited, the Chaminade boat kicked off its race with a strong start, clocking in one of the fastest beginnings in the event. 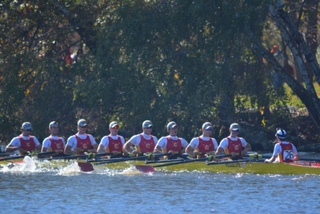 The Chaminade boat keeps pace during the Head of the Charles. After a very impressive start, the Flyers continued rowing at a fast pace. The rhythm of their rowing became steady as the race moved on due to guidance of coxswain William Mulhall ’17. As the race neared its end, the Chaminade boat struggled to keep its pace due to fatigue. In one final push, the team spent the last of its energy and was able to finish the race with a fantastic time. The Flyers exceeded expectations at the prestigious Head of the Charles Regatta. After finishing the course in 17 and a half minutes, the team placed 21st out of 84 teams in the Men’s Youth 8 Event. After seeing the team’s time and effort, the coaches and rowers were very happy with their results. “This boat is one of the best boats we have had in the past couple of years,” coach John Callinan ’84 said about the team’s performance. The Chaminade crew team has a lot to be proud of after its exceptional performance. The rowers’ quick start and fast time impressed everyone, proving that this team can compete against any boat it might encounter. The Chamiande crew team has many reasons to be optimistic. With the success at Head of the Charles behind them, the team is ready to finish its fall season with even faster times and attempt to reclaim its many titles from last spring. Posted in Sports and tagged crew. Bookmark the permalink.